The big business has, finally, believed in blockchain. Today, blockchain is no longer a thing for Bitcoin miners only, it has been recognized as a technology that can disrupt virtually any industry. Today, such names as Credit Suisse, JPMorgan, Maersk, Allianz, Volkswagen, and Delta Air Lines are mentioned in the context of implementing blockchain systems or exploring the opportunities that the new technology offers. 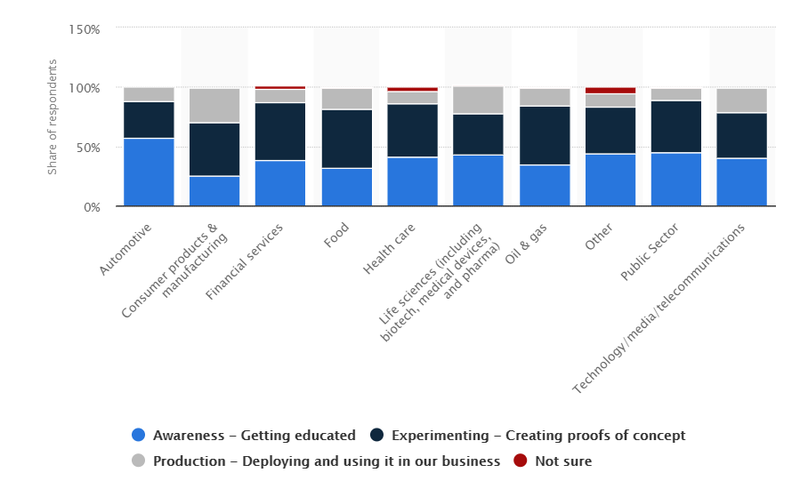 The statistics show that the blockchain awareness and adoption are growing with many industries already using blockchain products in their operations. This trend boosted the demand for blockchain developers. 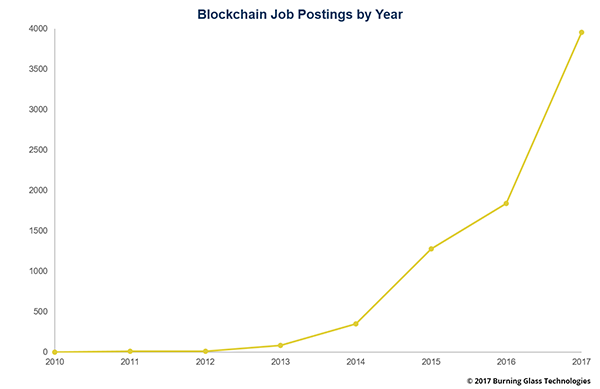 The year 2017 saw a fourfold growth of blockchain-related job postings, and the demand keeps growing in 2018, as well. Naturally, many development companies have started to offer blockchain development services, and if you Google â€œblockchain developmentâ€, you will get millions of hits. However, from the thousands of freelance blockchain developers and outsourcing companies, only a small percentage know what they are doing. Blockchain, while only a decade old, is already very complex and multi-faceted. The blockchain community is constantly experimenting with new approaches trying to make the technology more efficient. New frameworks appear, alternative consensus algorithms are being applied, other types of distributed ledgers are tried. As a result, building effective blockchain applications requires, on the one hand, considerable experience of working with similar product and, on the other hand, constant learning and being familiar with the most recent trends and innovations. Blockchain is developing too fast, and what was promising and forward-looking yesterday may be obsolete today. Hence, the problem – how to find the developers who can deliver an efficient blockchain product, particularly, an enterprise solution? In this post, we will try to work out some basic recommendations on hiring blockchain developers to ensure the best product quality. Letâ€™s start from the very beginning and decide how you would like to organize your blockchain development. In fact, there are two major hiring models – in-house and outsource. The main difference is that an in-house team is your team working in your office while an outsourcing team is an independent company that you contract to do the job for you. Both models have their specifics, advantages and disadvantages, and your choice largely depends on the type of your business and your project. Hiring in-house may be a good option when you are thinking of developing and supporting your own blockchain product. In this case, putting together an own team of developers may be wise. However, nowadays, the cons of in-house hiring may significantly outweigh the pros. The main concern here is the time. In implementing blockchain either to optimize your processes or to provide a higher quality service, you should be really quick, as the competition is fierce. To find, interview, test, and onboard a full in-house team can take long. Besides, hiring in-house requires a rather high initial investment. Office rent, workstations, software licenses, taxes – all those should be paid upfront. And do not forget salaries, sick leaves, vacations, various benefits, such as lunches, team building events, gym memberships. Maintaining an in-house team is expensive, and business is leaning towards outsourcing their software development more and more often. With outsourcing, all office and employee expenses are not your headache anymore. Besides, you immediately get a full team of carefully selected professionals, thus, no time is wasted on hiring. For fairnessâ€™ sake, with outsourcing you may have a feeling that you are letting the control out of your hands, but if you actively participate in the project planning and design, attend demos and make your suggestions as to the way the product is to be created, you are sure to get what you wanted. Of course, for projects requiring exceptionally high security, outsourcing may be unacceptable. Such projects are better done in-house with all software and hardware remaining within your perimeter. Better safe than sorry. A couple of words about freelancers. While there are many brilliant sole developers, a blockchain project usually requires a team – developers, business analysts, testers, DevOps. With freelancers, you may get a great cost-to-quality ratio, but you may lose the time needed to find freelancers for all positions. Consider freelancers for one-time jobs requiring very specific skills, such as graphic design or video editing. OK, we have convinced you that outsourcing may be your best option if you want a blockchain project to be built within reasonable time, on a reasonable budget, and with high quality. Now, the question is where to find the professional blockchain developers. In general, the developer rates in our world tend to lower from the West to the East. Traditionally, the highest hourly rates of software developers, blockchain included, are in the US, where a blockchain developer can charge as much as $200 per hour. Thus, outsourcing to the US may not be the most cost-effective option. Further to the East, in Western Europe, you can find professional blockchain programmers at $100-150 per hour. However, we recommend that you consider outsourcing to Eastern Europe, for example to Ukraine or Poland. Over the years, developers teams in these countries have proved to be able to deliver high-quality software products at the rates of $70-100 per hour. Besides, Eastern Europe has no problem in adopting the corporate policies common to the US or Western Europe, and there is no language problem whatsoever – almost 100% of the developer community in Ukraine or Poland speak English. By now, we have narrowed the search to outsourcing companies in Eastern Europe, but there are still too many options. Well, finding a reliable outsourcing partner is a tough job, thus prepare to invest some time and costs in this task. Before you reach out to the developers, prepare your project specification in as much detail as you can. Of course, as we mentioned, the specifics of the blockchain technology belong to the field of knowledge of true professionals, but you can lay the ground for the negotiations with the developers by describing what you want to have. Your business idea – what you do, what kind of products or services you provide, who your target audience is, and so on. Your expectations of blockchain – cost saving, faster processing, streamlined documentation management, higher security, all of the above. Your preferred technology – you may have certain requirements as to which blockchain technology should be used. For example, if you work with payments, you will need a platform that supports cryptocurrencies. If you intend to build a closed permissioned blockchain network, you will need a framework that offers access management. Your deadlines, if any – try to estimate when you would like the blockchain to be implemented or to define the major milestones. However, donâ€™t worry if you have no blockchain experts on board – most blockchain development companies will gladly consult you on the most optimal technology to be used in your particular case. Business analysts will study your requirements and suggest the blockchain tools to ensure the best performance. Start with online search in the professional communities such as Reddit, or on review platforms, such as Clutch. Browse the company description, read the reviews, compare the ratings. And definitely Google each candidate separately to find any other relevant information on them. Customer reviews or descriptions of the delivered projects will be a good place to start. Besides, you can also look for partners at offline blockchain events – conferences, meetups, hackathons. Such live gatherings give you a great opportunity of meeting a company representative face to face and seeing whether you can establish rapport with them. Once you have put together your â€œshort listâ€, reach out to them to discuss their expertise, technologies they work with, successful projects that they completed in your industry and, of course, their rates. Schedule a consultation on your project to see what the company has to offer to you. With all interviews, consultations, estimations, references, and reviews in your hands, you can now make an informed choice. We recommend that you do not get too optimistic about the lowest rates or the shortest timelines. Blockchain is a technology that is going to shape the future, and it should not be cheap. True blockchain experts will not charge the bottom rates, thus aim for those in the middle and top of your list. The technology matters, too. Today, effective blockchain solutions are not limited to Bitcoin or Ethereum only. There are new frameworks, such as NEM or Hyperledger offering alternative approaches to distributed apps. If you are considering an enterprise blockchain solution, look for companies that work with these platforms, as they are the most promising in this respect. As a result, you will have your perfect candidate. There is a good chance that the company will become your trusted partner for years, as blockchain is definitely going to stay. Once you have found a team of blockchain developers that are professionals in their field and are always on alert to the new trends, stick with them. If you are looking for ways of increasing your enterprise performance through implementing the blockchain technology, we can help you with it. Contact us for a free consultation on the best blockchain options for your project. Our team will be happy to share their knowledge and expertise to assist your business in beating the competition.